A pleasant pub alongside Brockwell Park in Herne Hill. The ales are Black Sheep Bitter and a couple of guests (on a visit in June 2008, these were Greene King Ale Fresco, and Lee's Dragon's Fire). On a summer day, the tables out the front are opposite Brockwell Park and are a pleasant place to sit. Food is served noon-3pm and 7pm-10pm Monday to Saturday, and noon-5pm and 6pm-9pm Sunday. The menu looks to have all the standard pub options photo of menu, but done well, with a particularly pleasing bowl of chunky chips. photo The artichoke, beetroot, asparagus, stilton & rocket salad served as a main (£9.65) was a towering affair with a huge heap of food on a rocket base. All mains order come with a shared bowl of bread and olive oil/balsamic for dipping. There's a pub quiz on Tuesday at 8pm, and a special offer on food (two courses for £10) on Monday. 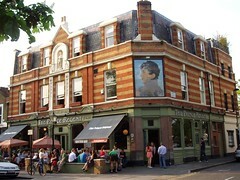 Note: As of mid-2009, the owners have also purchased the Talbot pub in Brockley and are refurbishing it to open in November 2009. Last visited by Ewan and others, 7 June 2008. Opening hours and food times taken from Time Out website, June 2008. Last edited 2013-09-12 23:28:58 (version 13; diff). List all versions. Page last edited 2013-09-12 23:28:58 (version 13).